Delle Donne displays the shooting touch that led to 32 points in a recent OT win against the Minnesota Lynx. 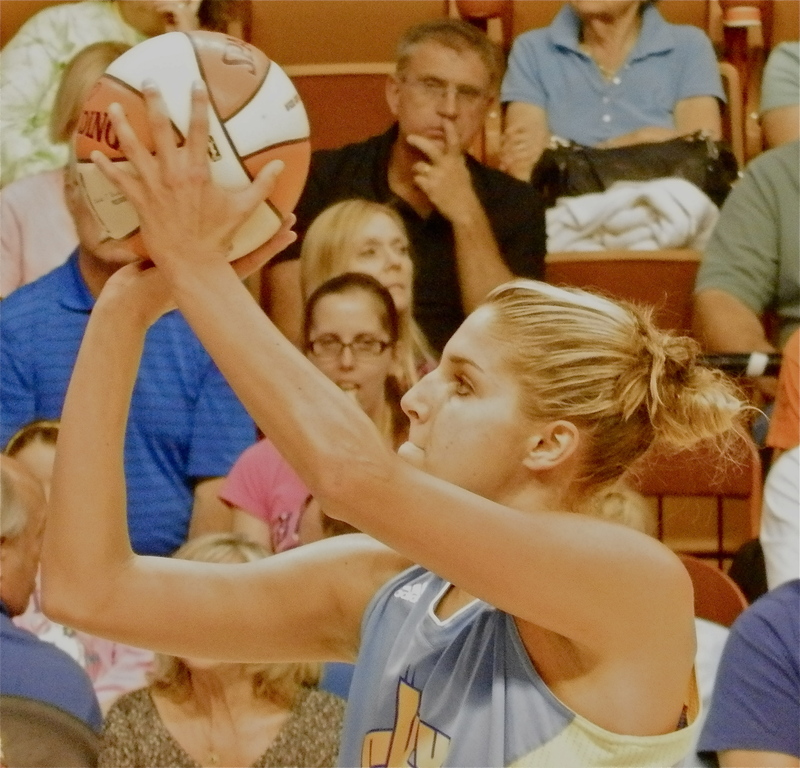 Elena Delle Donne is making her mark already as a rookie in the WNBA. If she can stay healthy down the stretch, the second overall draft pick last spring should easily be chosen the WNBA’s rookie of the year later this summer. 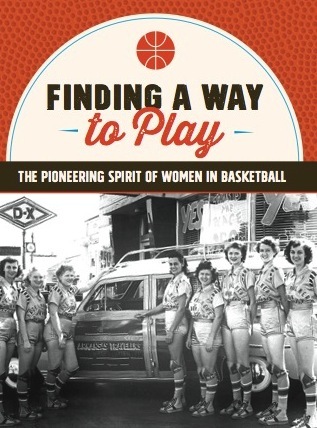 She may even be its most valuable player, given how she’s helped the Chicago Sky stay on top of the standings most of the season — an amazing feat given that this WNBA expansion team had never made the playoffs in its seven seasons. Delle Donne’s road to the WNBA is already a triumphant story of staying true to yourself in the face of setbacks and criticism. Blessed with extraordinary talents, the Wilmington, Delaware native was obsessed with developing her skills from an early age. She had a personal trainer at the age of 8, and since middle school, she’s been touted as the future Larry Bird of women’s basketball because of her ability to shoot the three, pass the ball, and block shots. Not surprisingly, the 6-5 forward, who is also comfortable playing a guard position, was recruited by UConn, Tennessee, and many other top NCAA schools during her high school career. She chose UConn, which was in the middle of its amazing consecutive win streak in 2008. It seemed at the time like the right thing for the consensus 2008 Naismith National High School Basketball Player of the Year — who wanted to be like her idol, Diana Taurasi, to do. What many didn’t know at the time, however, was how close Delle Donne was to her family and how much her heart ached to be near her older sister Lizzie, who has cerebral palsy and can not hear or see. To an 18-year-old college freshman, used to communicating daily with her sister through touches, hand signals, and hugs, the distance from Storrs to Wilmington was too much to bear. So, she transferred to the University of Delaware, endured all the criticism while taking a one-year sabbatical from basketball, and then continued her career as a Blue Hen, leading Delaware to its first Sweet 16 appearance ever in 2013, her senior year. Elena Delle Donne guards Connecticut’s Miste Bass in a recent game. 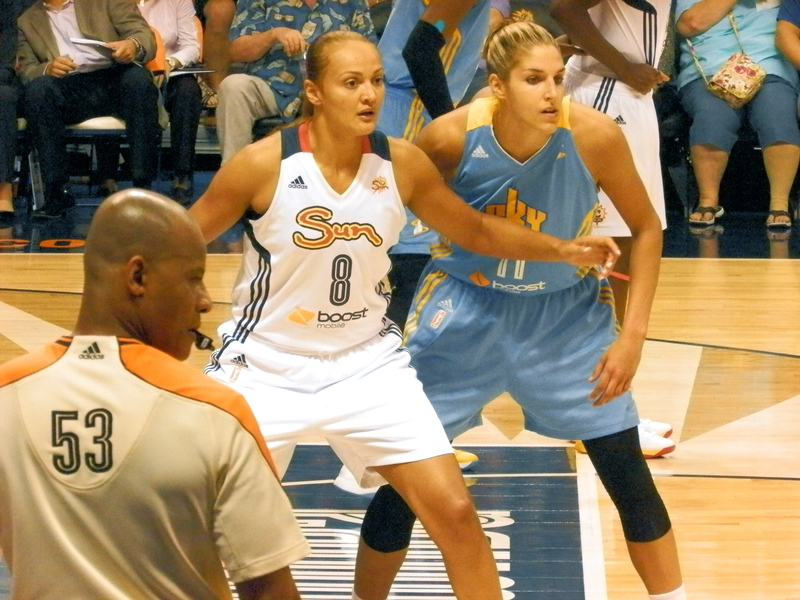 Delle Donne was selected #2 overall in the WNBA draft, behind Baylor’s Britney Griner. She’s having much more of an impact on her team than Griner is as a member of the Phoenix Mercury — or that Skylar Diggins, the other highly touted rookie from Notre Dame, is as a member of the Tulsa Shock. In a recent game against the Connecticut Sun, Delle Donne had a quiet first half, but then erupted with three 3-pointers after the break that put her team on top for good. She finished that game with 19 points and showed her ability to play help-side defense and gather rebounds — even when defending a guard on the wing. Delle Donne now lives hundreds of miles from her family. A tatoo with Lizzie’s name and a pair of wings attests to how close she still feels to her beloved sister. While Delle Donne has learned to cope with the distance, Lizzie is still often on her sister’s mind. Delle Donne is hoping to use her place in the spotlight of women’s basketball to raise money through a charitable foundation for people with special needs. And she certainly has learned to fly.